CostaBravaTouristGuide.com — The autonomous Spanish community of Catalonia, whose Costa Brava is one of Spain’s most popular tourist destinations, started to levy a tourist tax on November 1, 2012. The Catalonia Tourist Tax applies to any facility where tourists stay overnight — from campgrounds and youths hostel to hotels and cruise ships. Tourist apartments and private houses rented to tourists are subject to the charges as well. November 2018: This information is still current. We update it when necessary. Incidentally, some people ask us about Costa Brava Tourist Tax rates. 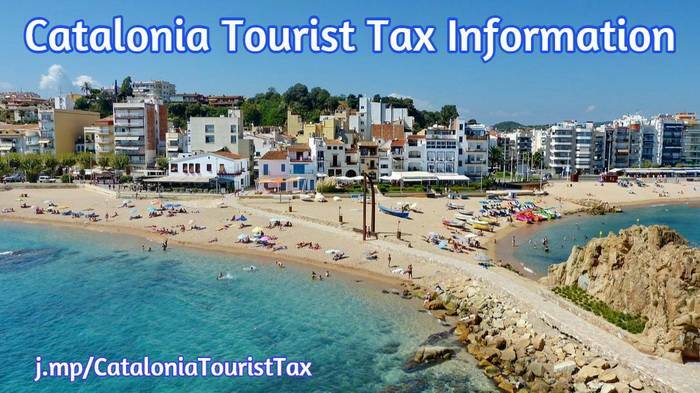 The Costa Brava is part of Catalonia, and does not have different tax rates. Note that the city of Barcelona, the capital of Catalonia, does levy higher fees. Hotel operators and others in the travel industry initially were upset, citing anything from the unfounded fear that tourists will decide to vacation elsewhere to the cost of updating hotel management software packages. But the Generalitat de Catalunya points out that most countries in Europe and many throughout the world have long had similar measures in place, and that income derived from the tourist tax will result in more tourists visiting the region. Indeed, the number of people traveling to Catalonia has increased every year. Last year the region welcomed 17.4 million foreign tourists — 3.7% more than in 2014. According to figures published in August 2016, more than 10 million international tourists visited Catalonia between January and July. That number represents 25..3% of all international tourists travelling to Spain during that period. Note: 2.8 million foreign tourists arrived in Catalonia during the first quarter — an 8.3% increase compared to the same period in 2015. Under the terms of a bill approved in March 2012, the tourism tax fees are used to finance the Tourism Development Fund, founded that year. It produces promotion campaigns for tourism in Catalonia. The Government promotes Catalonia as a prime tourist destination throughout Spain, Europe, and the rest of the world. In addition the tax is used for “tourism-related infrastructure” — which includes anything from the upkeep of seaside boulevards or the rebuilding of beaches after they have been damaged in storms, to payment of salaries for extra police man hours during such events as Blanes’ famous annual international fireworks festival. It would not be fair to expect local residents and businesses to bear all the costs related to the tourist industry. The tax is a small price to pay in exchange for clean beaches, well-maintained roads, and good facilities. When it was introduced, the Catalan Government expected the tax to raise €50 million per year. In 2015, €43.5 million was raised, a 5.5% increase in revenue from 2014 (€41). Since its inception in November, 2012, a total of €126 in tourism tax has been generated for Catalonia. Details for the year 2016 are not yet available. The revenue is split between the Catalan Tourism Agency, local tourism boards and town halls. According to Jordi Baiget, of the Catalan Ministry for Business and Knowledge, the increase in 2015 is “parallel to the increase in tourists.” Last year hotels generated the largest amount: €34.3 million. Tourist homes — ranging from apartments to villas — brought in €3.6 million, an increase of 38.6% or €1 million since 2014. This increase is largely due to new rules and regulations which, among other things, make it illegal to rent homes to tourists without permission. “We now have more than 54,000 tourist homes we knew existed but were not regularised,” Baiget explains. The Catalan government says 2015 saw widespread growth of tourism in most parts of Catalonia. Incidentally, Barcelona generated €23 million in tax, more than half of the total amount raised in 2015. In December 2016 it was announced that Barcelona would receive an extra two million euros of the tourist tax collected by the Catalan government. The city will eventually receive 9 million euros a year, much of which will be allocated to projects designed to decentralise tourism and increase cultural offerings. Barcelona has received nearly 29 million euros since the tax was introduced in 2012 — a third of the overall amount collected by the Catalan Tax Agency. Catalonia Tourist Tax: How Much? Not much, really. In fact, the Government says that for 96% of tourist who visit Catalonia the new tax will add only 1% to their total spending bill. In 2017 some fees were raised slightly. An extra, ‘special rate’ was added for places where legal gambling occurs (e.g. a hotel with a casino). The amount depends on the type of establishment you are staying at, as well as whether you are staying in Barcelona or the rest of the country. In addition, if you are staying in Catalonia as a participant in a social program operated by the public administration of a European Union member state. (If you didn’t quite understand that, rest assured: it does not apply to you). From time to time we hear from people who run into higher charges than those listed above, with some accommodations listing an additional ‘hotel tax’ as well. However, according to the Generalitat de Catalunya — the Government of Catalonia — there are no additional tax charges (other than the normal 10% VAT over the entire bill) that apply to tourists. If your hotel charges higher rates under the guise of ‘tourist tax’ — or charges you an additional ‘hotel-‘ or ‘bed tax’ — you are being overcharged. If you believe that is the case, stay calm and polite. Do, however, visit the Ajuntament (City Hall), a police station, or the local tourist office and ask for their help. If you have booked through a third-party, such as a tour operator that provides a holiday package including air travel and hotel fare, you should check whether or not the new tourist tax has been included in the total amount paid. The Costa Brava resort of Tossa de Mar is a popular destination for a day trip. But regardless of whether you book or pay the hotel (or other establishment) direct or via a third party, the hotel is obligated to provide an invoice that presents a clear and separate breakdown of the amount of tax charged. (This doesn’t mean you may be charged twice. It simply means there must be a paper trail documenting that the tourist tax has been paid). If the tourist tax was not already included in the payment you made to a third party, you will have to settle the bill at the hotel. Note that the invoice is subject to the normal 10% VAT (Spanish: IVA; Catalan: L’IVA) for hotel accommodation. Upon learning about the Catalonia Tourist Tax, some people are indignant. See, for instance, some of the comments below this article. In most cases, the people complaining the loudest themselves live in countries were the visitors tax is significantly higher. The vast majority of people realize the fees do not amount to much, and they understand what the money is used for. Hotel associations say they have had notably few complaints from tourists. And as shown above, tourism numbers are way up. By the way: Some people use the term ‘Hotel tax.’ Others refer to ‘Tourism tax.’ The Catalan government’s Ministry of Business and Knowledge uses the term ‘Tourist tax.’ These terms all refer to the same thing. Until recently Catalonia was the only of Spain’s 17 autonomous communities that charges a tourist tax. Initially people thought that as the country’s economic crisis deepened other regions would follow Catalonia’s example. Instead, some communities (e.g. Andalusia, the Canary Islands, and Madrid) have actually ruled out such a scheme — for now. The success of Catalonia’s program may eventually inspire other regions to follow suit after all. In fact, there are indications that Valencia, which includes such tourist hot spots at Benidorm and the Costa Blance, may introduce a tax in 2017. Interestingly, the city of Barcelona, Catalonia’s capital, is actively considering charging day trippers — visitors who do not stay overnight — a tourist tax. According to the proposal, this would affect cruise ship passengers and people on organized tours. The reason behind such a fee is that Barcelona is so overrun by tourists that it is bursting at the seems. The ever increasing number of visitors have Barcelona locals complaining about anything from antisocial behavior to narrow streets being blocked by large groups. Barcelona sees 30 million visitors a year, of which 8 million stay in hotels. As in many other popular cities, authentic shops have made room for souvenir outlets, rent prices have been going through the roof due to the Airbnb effect, and it is increasingly difficult to find enough room at the beach to put down your town. It is reported that Barcelona City Council is considering the imposition of a tax on visitors staying overnight and travellers who only spend the day in the city. At present the proposal is under study, but if accepted the measure could become effective sometime in 2017. Proposed rates have not yet been publicized, but a Barcelona city tax would be levied in addition to the Catalonia tourist tax described on this page. The Balaeric islands — an autonomous community that includes the popular holiday destinations of Majorca, Menorca and Ibiza — have introduced a tourist tax effective July 1, 2016. Update, May 2017: To this day there has been no further information on whether the proposal to levy an additional tax on day-trippers visiting Barcelona will be accepted. Many people believe the scheme would be unworkable. Some suggest that only coaches (excursion buses) will be charged — a fee that most likely will be included in the cost of the tour. © Copyright 2017 CostaBravaTouristGuide.com. May not be republished. Links encouraged. This article was first published in November 8, 2012. We take care in keeping it up-to-date. The last update occurred on Saturday, May 13, 2017. You are welcome to share this photo, with or without a link. The whole dwelling is rented (and not just a few rooms or a floor in an otherwise occupied house or apartment). It must have a certificate of occupancy and comply with general technical and quality standards for housing. These places may not be occupied by more people than indicated on the certificate of occupancy. These establishments must be adequately furnished and have all the appliances and utensils necessary for immediate use. Everything must be in a perfect state of hygiene. Yes, the tourist tax is charged on each visit you make — but only for the first seven nights of each stay. As a frequent British Tourist, having Spain as my main holiday location, I am appalled at this Tourist Tax charge! Spain, having no natural resources of its own – such as oil, gold, silver, copper, etc – depends completely on the Tourist, and heavily on the British Tourist, to boost its economy. Therefore, it is a complete INSULT to the Tourist/Holiday-maker to exploit us as we pay the lion’s share to maintain the Spanish economy. It is akin to biting the hand that feeds you, and as such I will never pay this tax, and go elsewhere for my holidays. I and my family and friends will NOT be held ransom by such a stealth tax. Disgusted British Holiday-maker. Oh boy, where do I start, Mr. C. McClinton? First, Spain has many natural resources. Google is your friend, so look it up. Many countries, regions, and cities throughout the world charge tourist tax. Doing so benefits tourists (read the article you are commenting on), and also helps create more jobs, which in turn helps the local population. As a Christian (I checked your name and email address and read your testimony) you should not begrudge it when people who find themselves in an economical tight spot find a legal way to help both themselves and others. Besides, taxation is a fact of life, and you know what Jesus said on the subject. You are free to go elsewhere, of course, but the list of countries and places that charge a tourism or hotel tax is growing, so your options are dwindling. Boycotting Spain is as silly as not buying goods at stores in Ulster because they charge a sales tax. That said, tourism is Spain — and in Catalonia in particular. Catalonia has seen a 2.3% increase in visitors compared to last year. Are these prices set in stone with regards to the tax? The apartments I am staying at in Salou on Saturday apparently charge 3 euro per adult per night? @Lee: I believe that Salou, like some other towns and municipalities throughout Catalonia (and the rest of Spain) does charge a local hotel tax in addition to the Catalonia-wide tax. You may want to check with the tourist office or with the adjuntament (city hall) to see whether you are being over-charged. I am now told that this tax is applicable to those over 12 years old (recently stayed at AC Suites by Marriott) and was charged for 3 people (inc 13 yr old). Was I overcharged or is this a chance to update your website? I was not told about this tax before I booked my holiday, had I known I would have gone somewhere else. Fleecing tourists who already work hard and save hard for their annual holiday is not a good way to be doing business. I already pay enough tax on my earnings. I have only been to one country which charges a tourist tax and I won’t be going there again. However, I’m glad the tax was not hidden by the hotels in their charges. @Cheesed off holidaymaker. Your email address indicates you live in the UK. And your comments show that you haven’t traveled much. See also, Why is UK hotel VAT so high? http://j.mp/UKhotelVAT Note the chart. Spain’s hotel/tourist tax is very reasonable. Our article above indicates what the income from the tax is used for, showing that tourists such as yourself benefit from improved facilities, clean beaches, good roads and transportation, safety measures, and a whole lot more — all without you and your vacationing family becoming a burden to the native population. @Richard Golding: I think you were overcharged. The official information published by the Government of Catalonia says that children aged 16 and under are exempt. Hi there. Great article and very helpful, however could I ask you. If I am a resident of catalonia, do I have to pay the tourist tax? Yes Chris, as is the case in the vast majority of countries that levy tourist tax, residents are subject to those fees as well. That is because local visitors have pretty much the same impact as visitors from abroad. If 1000 people spend a weekend in Barcelona, it makes little to no difference whether they came from Girona or London. In either case, Barcelona spends money for the upkeep of roads, safety measures, public transport, law enforcement, et cetera. Portugal is a nice country indeed. But like countless other countries, it has a tourist tax. Just not as high a tax as the UK — your own country — levies. The reasons behind tourist taxes are well-explained in the article. Both tourists and the locals benefit from them. Since more and more countries levy a tax on tourism, you may have to simply vacation in your own backyard. Say goodbye to your tourist industry Spain. That’s a very strange comment, Frank. You did not read the article correctly. First, your IP number identifies you as being in the UK. See this comment, in which I provide a link to an article that shows “only one country has higher tourism tax rates than the UK.” Have you noticed any decrease in tourism at home? Second, what does tourism in Spain have to do with tourism in Catalonia? Catalonia is one of 17 autonomous communities in Spain. It is, for now, the only Spanish community that charges a tourist tax. Other may well follow soon though, given the success of the tax — and the purpose of the tax (read the article). Third, you are wrong. Tourism in Catalonia is way up with record-breaking numbers, as is tourism in all of Spain. Hi. If we are staying in a house booked privately, 2 adults, 2 children this summer for a fortnight, near Rhonda Valley who do I need to pay the tax to and how do I go about it please? Hi Sarah, you would pay the tax rate listed under ‘others’. The person or company your rent the house from should add the charge to your bill, listed as a separate item. If the charge was not part of the original booking, you may be charged upon arrival. Applying the tourist tax charge is the responsibility of the person or company you rent from. Have a nice vacation! I booked through Jet2holidays and they did not mention the tourist tax either until it appeared on our booking confirmation and it appears we have to pay this amount separately (shame on Jet2holidays for forgetting to mention this). However, having said that less than one euro a night for a maximum of seven nights of our stay is not a life changing amount. I read with amusement some of the previous comments – some countries charge a lot more for you to enter or leave and that doesn’t stop people going there! Am really looking forward to my holidays soon. Hello, The owner of the airbnb I am staying at says we need to pay the 2.25 for all 12 nights but this website and another website I have been on say you pay it for only the first 7 nights. The owner is being very difficult and is now shouting at us on the airbnb site. Please clarify for me. I am not being difficult, but I did do my research and can’t find anywhere that you pay the tax beyond 7 nights. Thank You. The owner is wrong. You pay tourist tax over the first 7 nights of your (continuous) stay in one place. Only if you were to move to another place, say another Airbnb or a hotel, then you would have to again pay for up to 7 nights. Stay tax of €25.00 per night, per person will be due to the owner upon arrival. Does not apply to children under 18 years. I booked a VRBO and had a total bill i paid and said no refund and this came up . It says 25.00 that is way different than 2.25. that is almost $1000 after the exchange? That does not sound right at all. Note that the owner must by law provide you with an itemized bill showing exactly how much was charged in tourist tax. This is true even you you paid ahead through a different company. The rates listed on our website, in this article, are correct.